Adjacent to Pisgah National Forest, Moses H. Cone Memorial Park, Julian Price Park, and the Blue Ridge Parkway, Blowing Rock is the perfect place to begin your hiking adventure. Also nearby is Grandfather Mountain, the Linville Gorge Wilderness area, and parts of the Mountains-to-Sea Trail. There are so many beautiful places in our backyard… what are you waiting for? Hiking is a great pastime in all seasons. Click here to see 5 REASONS TO HIKE IN WINTER, and some great tips for preparing for your winter hike. The Blue Ridge Parkway has so much to offer hikers. Trails vary greatly in difficulty, which means that there is something for every skill level. 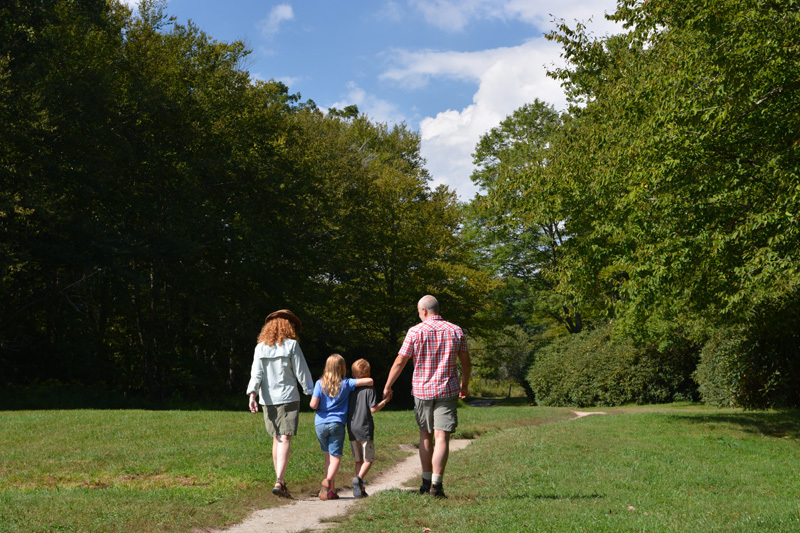 The Parkway provides great access to most parks and trails in the area, including Moses Cone and Julian Price Parks. Click HERE for a list of trails that can be accessed from the Blue Ridge Parkway in NC, and their difficulty ratings. Blowing Rock is located at milepost 292 on the Parkway. These are official maps for trail networks on the Blue Ridge Parkway that are near Blowing Rock. Click on each one for a downloadable and printable PDF file. 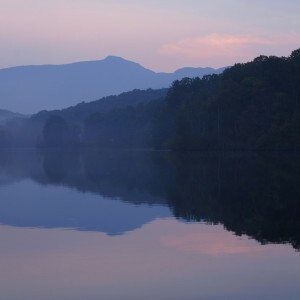 The Pisgah National Forest covers 510,119 acres in four districts: the Grandfather, Toecane, French Broad, and Pisgah districts. Blowing Rock is located on the eastern boundary of the Grandfather Disitrict. Click HERE for a map of the Grandfather and Toecane districts of the forest. 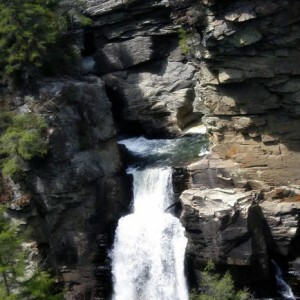 The major highlights of this area are the Linville Gorge Wilderness Area and Grandfather Mountain. For hiking only you may access Grandfather Mountain State Park from off-mountain trailheads. Hikers are asked to register before hitting the trails. Linville Gorge Wilderness trails are signed at trailheads but are not signed or blazed once inside the wilderness. You should be able to read a topographical map and use a compass. These trails should only be attempted by experienced hikers with proper equipment! Wilson Creek Wilderness Area offers challenging trails in a rugged and beautiful setting with secluded coves, cascades and waterfalls, and plenty of watering holes for wading and swimming. Most should only be attempted by experienced hikers. The small communities of Globe, Gragg, and Mortimer are found in the area, and access is limited but fairly simple. Follow Roseborough Road or Edgemont Road from the Blue Ridge Parkway or Globe Road from Blowing Rock for the easiest routes. Despite marked roads, four-wheel drive is still recommended. A trail map is also a good idea- pick one up at a local outfitter as phone signals can be limited in remote areas. For a user-friendly index of several trails, click here. The Appalachian Trail is a 2,175-mile long footpath stretching through 14 eastern states from Maine to Georgia. In this area, the trail generally runs along the NC/TN border through the Pisgah and Cherokee National Forests. The Official Website for the Appalachian Trail has detailed info on the trail, as well as downloadable maps. The Mountains to Sea Trail of North Carolina is a 935+ mile trail consisting of footpaths, roads, and state bike routes from Clingman’s Dome in the Smokies to Jockey’s Ridge on the coast. Click on “trail information” on the Official Website for trail maps. The Glen Burney Trail in Blowing Rock offers a rugged experience just steps from Main Street! Descending 800 feet into the John’s River Gorge, the trail follows New Year’s Creek with views of three waterfalls, two of them fairly large. This 1.6 mile trail ends at Glen Mary Falls. It’s out-and-back, so the hike is 3.2 miles round trip. The trail head is located at Annie Cannon Gardens on Laurel Lane. Please note that this is a strenuous, steep trail. Click here for a map.